Another dominant week for Gonzaga has the WCC-leading Bulldogs atop the latest AP Top 25 Poll released Monday. The Bulldogs' rise was accompanied by Duke's fall, as the Blue Devils -- ranked No. 1 last week -- went 1-1 this week with a 16-point loss to rival North Carolina. They dropped two spots to No. 3. 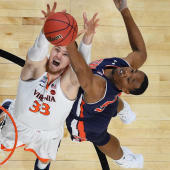 Sandwiched between the two is Virginia, which notched wins over Virginia Tech and Louisville over the last week. Kentucky remains steady at No. 4, and North Carolina moves up three spots to No. 5. Others receiving votes: Louisville 90, Villanova 63, Iowa St. 58, Mississippi St. 28, Auburn 16, Baylor 10, VCU 4, Old Dominion 2, New Mexico St. 1.